Sorry if it seemed a bit quiet on the crowdSPRING front yesterday. Ross is off somewhere enjoying the great wilderness that is the American Midwest, I was attending an interesting seminar / crash course-asaurus rex (the folks at Gaspedal can thank me for the formal name later), and that left poor Mike to man the Community front on his own. Luckily, he survived, and I am back – with 100% more scrubbing power and a fresh, new scent! I’ve deemed this Thursday the day that I launch my new feature – The Weekly Glance of Awesomeness. Every week, I’ll delve deep into the trenches of crowdSPRING projects and snag interesting ones that encompass the entire creative range of our site. I’ve made a point to find projects with active buyers giving good feedback, interesting design problems, and your not-so-typical buyer. If you have any tips or suggestions for future Glances of Awesomeness, feel free to leave a comment with the link, and I’ll be sure to check it out. 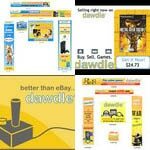 The Breakdown: Dawdle is one of our fellow Chicago tech start ups. These lads have the largest marketplace for specifically video games, systems, and accessories. They came over to the crowdSPRING office last week and proceeded to kick our butts in ping pong and Guitar Hero. We were missing our magic weapon Pete, Director of Marketing, but I’m not going to make any excuses. They are looking to our team of awesome creatives to develop snazzy banner ads. Make us proud. Then, we will have to challenge them to a re-match to make you all proud! The Breakdown: We love people who love crowdSPRING! Buyer rcavezza posted his first project, a logo design for a venture called SmarterDrinker.com two weeks ago. Looks like he can’t get enough of crowdSPRING, and he’s posted a new project for SmarterFootball.com‘s logo. SmarterFootball is a new venture offering advice and scholarship leads for football players looking for colleges. We like anything that’s smarter, so kudos to you, rcavezza! The Breakdown: I know, I know…Anyone who visits our site can’t ignore the huge graphic on the front page promoting this print design project, but come on. It’s Judas Priest! How cool is that? 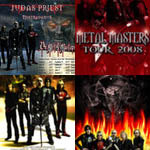 We were really excited when Epic Records came to us and said that they wanted crowdSPRING’s community and Judas Priest fans to create the band’s official online tour poster for their upcoming US Metal Masters Tour. The entries have been oh-so-heavy metal, which is fitting for one of the founding forefathers of the heavy metal style. Nobody pulls off leather quite like frontman Rob Halford. 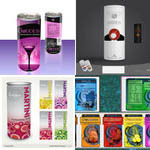 The Breakdown: Goddess Spirits are launching a new line of non-alcoholic, carbonated Martini beverages, and they want our community to design their package graphics. Imagine going out on the town, and seeing your design featured on a product in all hot clubs, bars, and nightspots. I hope the Goddess Lemon Drop is as good as the real deal!